Gary Para - Strolling Close-Up Magic. In close-up magic, you are part of the show! No other branch of theatre requires you to be part of the performance. The actor does not invite you onstage to assist Macbeth. The musician does not need you to come up and join in a guitar solo. The soprano does not ask for aid in the middle of 'La Traviata.' Only a magician cannot function without an audience – it is an integral part of the show. Magic is the ultimate participatory art -- where the spectator is both the focus and the validation. Good magic makes the audience a part of the play, where the theatre, in essence, is inside you. With close-up magic, there are no giant boxes hiding secrets. There is no forty-feet separating you and the magician. The cards go in your hands; you see the coins right under your nose. And, miracles still happen. The words you will hear most often coming out of a close-up magic show are, "Oh my God -- I was standing right there, when…"
It is intimate; it is personal. Close-up magic brings people together, because they all know that they are seeing the same thing, with no camera tricks and no outtakes. It is the most personal entertainment in the theatre arts, because it happens one-on-one. Magician Gary Para performs close-up magic in informal walk-around settings, such as at receptions or in lounges, where often he is totally surrounded by an audience. Magic at formal settings such as weddings, graduations and communion parties add fun to your special occasion. The Magic is performed "in the hands" (without the necessity of a table) while the Magician mingles with the guests. This type of performing is most suitable for events where there is not a specific performing area. Close-up magic is a wonderful ice-breaker for a crowd, setting a festive mood for your event. Magic is a great conversation starter. People will turn to each other and talk about what they have just seen. Gary can work for small groups of 3 to 15 people at a time, entertaining them with interactive close-up magic. 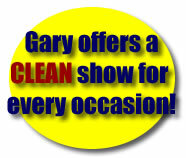 When performing close-up magic, Gary combines sleight-of-hand, humor and fun to entertain your guests. The intimate nature of close-up magic is a powerful element of the performance, allowing Gary to perform miracles right in the hands of your guests. Close-up magic is the perfect way to entertain your guests while they are mingling during a reception, waiting for their meals between courses, or enjoying cocktails in a hospitality suite. Another benefit of close-up magic is that Gary can entertain people who cannot or choose not to dance. This way, no one feels left out at your event, and everyone has a wonderful time. Table-Hopping defines one type of close-up magic, where the magician walks from table to table (or from one group of spectators to another), offering at every table a unique magic show of a few minutes. This type of magic is suitable for larger meetings, parties or anywhere else where many people should be entertained. Or would you, as a restaurant operator, like to have your clients be entertained while they are waiting for their meal? A 25 to 30 minute show. Gary 's close-up magic show is similar to his strolling magic as it features many feats of sleight-of-hand. Spectators are completely in the proximity of the happening. This special form of the magic art is appropriate for a rather small audience (max. about 30 persons), because it should be possible for every spectator to see exactly what is going on. The formal close-up show is performed at a fixed location and is perfect to present in your entertainment room or a hospitality suite. A 15 to 30 minute show. 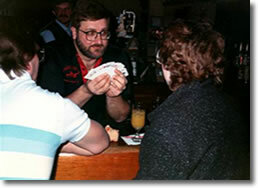 Gary's comedy magic show mixes classic magic with audience interaction. This show is perfect for intimate banquets and after-dinner shows. Everyone loves magic, they will tell their friends and their friends will come into your restaurant to see. The magician is an extension of your staff-someone to greet guests, someone to take care of requests before they become problems, and someone to entertain and make the guest feel special. This means no lost table space for your restaurant. We all know it happens; "I'm sorry it will be just a few more minutes on your steak." or "we are on a 45 minute wait right now." What percentage of business is lost to walk outs? Wouldn't it be nice if those people could be entertained while they wait?